A witty comic about what it means to be a reader and book lover. With whimsical scenarios and a relatable main character, this comic explores the every day lives of those unique people obsessed with reading. The artwork is clean and simple, but appealing and very expressive. I love that some of the pages are funny comics about being a reader, and some of them are a little more serious about how magical it is to get lost in a book. 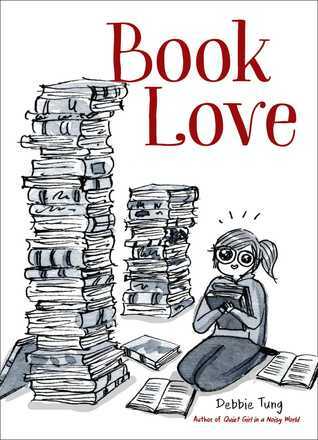 From those frustrating things like stickers on a book cover that drive readers crazy, all the way to the delight of connecting with other readers over a shared love of books, this comic encompasses all the aspects of a reading life and what makes readers so special. I loved every page! I would love to see more comics from this author/artist! Disclaimer: I received an ecopy of this book from the publisher in exchange for a free and honest review. All the opinions stated here are my own true thoughts, and are not influenced by anyone. It’s an adorable book, I just wish it had been available for purchase before the holidays! True. It would have made the perfect Xmas gift!